There are many companies that manufacture and distribute different types of garage door openers. Our garage door opener technicians know the key components inside the housing of a garage door opener, as well as external components. Improper safety eye alignment can cause a garage door opener to malfunction, endangering both the safety and further potential damage to your garage door opener. Our technicians are skilled with an extensive amount of training making a safety eye alignment a quick and easy fix. 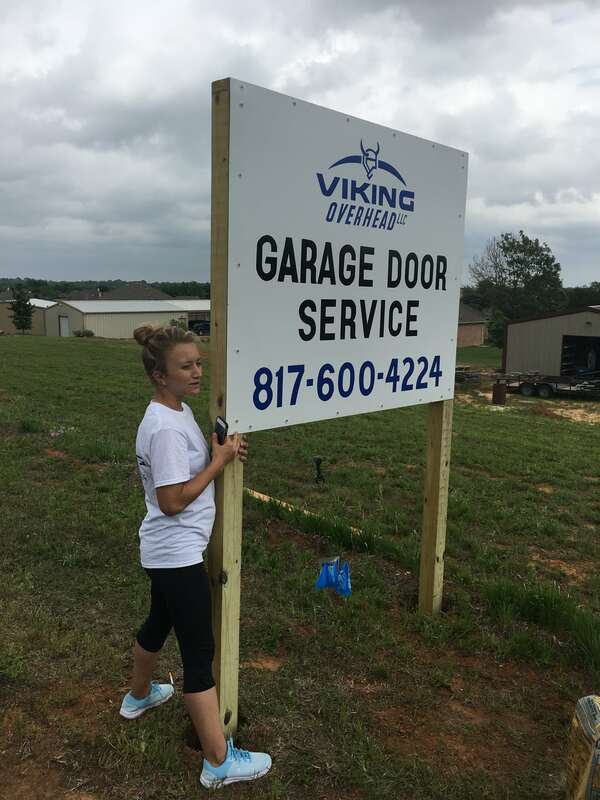 Viking Overhead can also test your safety eyes if they are in need of replacement, our inventory includes replacement safety eyes, as this a common malfunction identified with garage door openers. Garage door keypads and wall buttons are also another external component of garage door openers that are prone to malfunction, but it’s a walk in the park for our technicians here at Viking Overhead as each technician has a working knowledge of home power sources and all garage door opener electronic devices. Inside the housing of your garage door opener, there are many moving components vital to the functionality and operation of your garage door opener. Power surges , depending on the configuration of your home’s ability to protect against them, can often fry electronic devices, rendering them completely useless including your garage door openers. Viking Overhead recommends using power surge protectors in order to prevent an overload of electricity filtering into your garage door openers circuit board. Garage door openers are designed to operate with low-voltage, for energy-efficiency and safety, therefore without a surge protector your garage door opener is at risk during any type of power surge, the most common being an electrical storm. However, our garage door technicians are skilled and are able to replace the circuit board in your garage door opener safely and correctly. Gears, sprockets, couplers, and trolleys are also a major components of your garage door opener, sometimes they wear quickly because of improper garage door balance, causing the motor to work harder. But our technicians are required to replace all garage door components in training and in the field, and this cost-effective method can save your garage door opener as well as your wallet! Viking Overhead also installs new garage door openers. But before your new garage door is installed, our technicians check the balance of the garage door before the installation of a new opener is installed. Balance is a key factor in the life your garage door opener. Garage door openers are manufactured to help guide the door up, and garage door springs are really the components that do the heavy lifting. Balance means the garage door springs are doing their job, the average garage door weighs over 100 pounds and without proper spring configuration, the balance can be off, which will damage your garage door opener. At Viking Overhead, we check the balance of the door and proper garage door spring configuration every time before installing a new garage door opener. 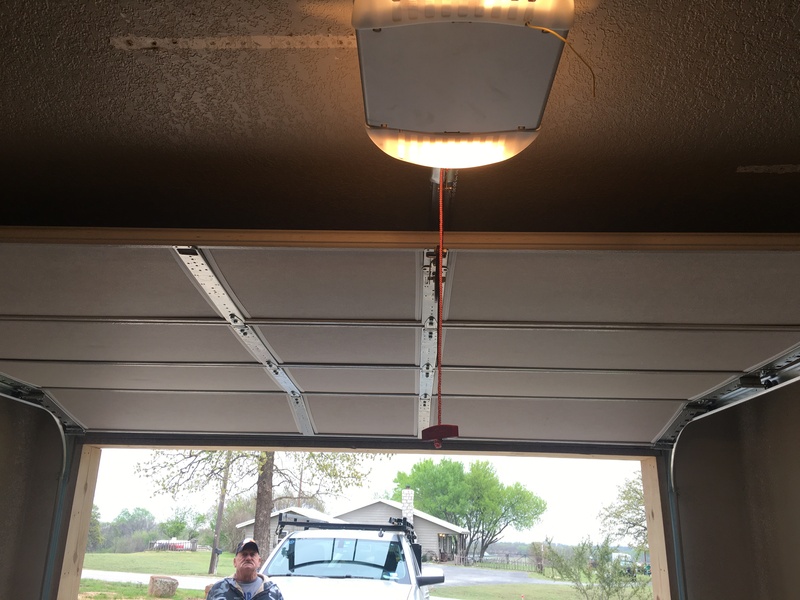 During installation, our technicians take pride in their work, and guarantee a quick and clean job for the installation of a new garage door opener. 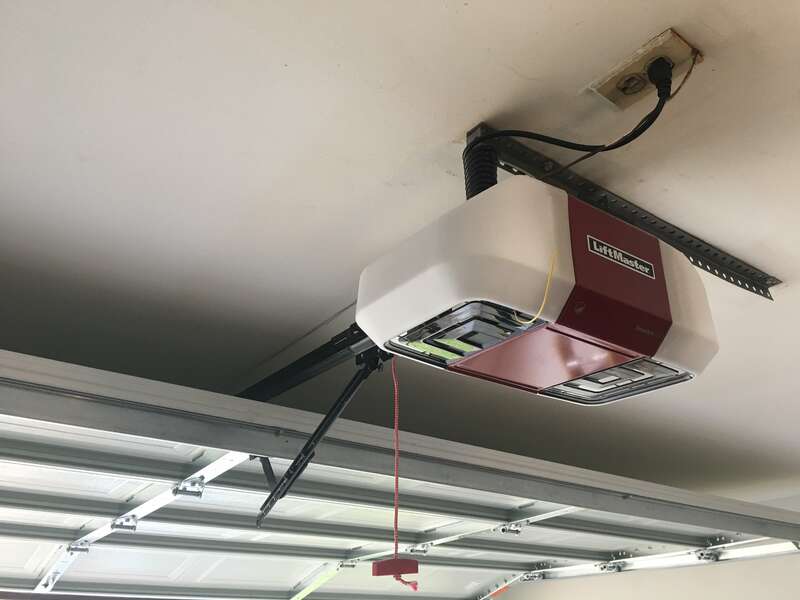 Our trucks are always equipped with high-quality Liftmaster and Chamberlain products so you won’t have to wait for your new garage door opener. Garage door openers offer added security to your home, locking down the garage door when in the closed position. Garage door openers also upgrade your garage door with ease of entry while parking your car and securing your personal vehicle. Garage door openers conveniently open and close your garage door automatically instead of hand-lifting opening and closing the garage door.. There are many options when it comes to garage door openers, Liftmaster garage door openers and Chamberlain garage door openers manufacture chain drive openers, belt drive openers, and jackshaft garage door openers. 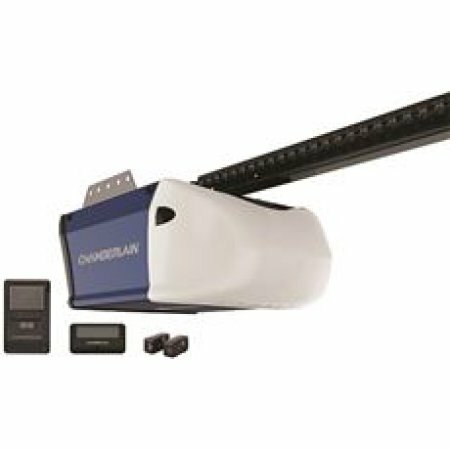 A chain drive garage door opener is the most common, these garage door openers are equipped with a heavy-duty-lightweight type of chain, similar to a bicycle chain pulled by the gear shaft that is located on the top of the housing of the opener and spins when the opener is in operation. With the right amount of tension adjusted by our technicians, the chain becomes tight, and pulls a trolley attached to a j-bar, which is attached to your garage door. Pulling from of the center of the garage door ensures smooth operation. These type of garage door openers are suspended by a rail attached and centered to the header above your garage door. There are a few types of rails that fit with our Liftmaster and Chamberlain products, sectional rails attach to garage door openers in pieces, there are also solid rails which come as one piece of solid steel, and a heavy-duty I-beam rail which is used for heavy duty garage doors. All three types of rails can be observed for a chain-drive opener depending on the product purchased. Another type is a belt drive garage door opener, which operates in the same fashion as a chain drive , only instead of a chain, a rubber steel reinforced belt is attached to the motor head of the garage door opener. One advantage of the belt drive garage door opener is the quiet operation of the belt made of steel housed in rubber, these garage door openers are also known for the motor being quieter as well. The jackshaft type of garage door opener is attached to the torsion bar above your garage door rather than being suspended by a rail. Jackshaft garage door openers have added security features such as an automatic deadbolt that locks the garage door with a heavy duty bolt system right into the garage door track. Many customers prefer the jackshaft type of garage door opener because it is somewhat hidden as compared to the other types that require a rail hanging over the center of the garage door. But no matter what type of garage door opener you choose, Viking Overhead is able to install them all, and are technicians can provide the best option for all our customers! New garage door openers also have options for an outside keypad, and extra remotes for your convenience. When choosing from the latest models in garage door openers , customers also have the option to download an app to their mobile device that allow the customer to see the status of their garage door. Coupled with the technology of the latest garage door openers, the app can also open and close the garage door opener from the mobile device. The password protected app ensures family members will never be locked out again and allow the homeowner to monitor the security of their garage door from anywhere!